In the data point collection spreadsheet for the CSR applications, the average stated income is ~$135,000 w/ ~750 responses (i took out a couple of outliers that were likely typo mistakes). according to cnn money, $135k (household) is the top 14%. The average age is 30 yo. 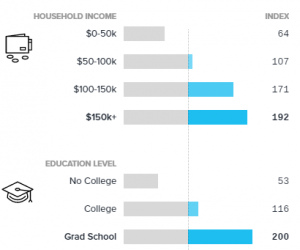 So the average churner is 30 years old and makes $135k (likely household). Seems pretty upper middle class to me, wouldn’t you agree? The Points Guy’s readers are apparently doing even better, possibly because they’re less likely to have kids if the demographics are to be believed. There’s a useful concept called the hedonic treadmill which essentially says that people never get any happier. Sure, you can be temporarily giddy when thinking about that trip you’re going to take or that car you just bought but soon enough you get used to it and return to being your normal self. For many years now banks have for some reason seen fit to allow (and obviously, I’m generalizing here) affluent and well-educated people to earn money and take trips with little effort on their part. That gravy train is slowing down and has been for some time, though there’s still plenty of fun to be had. It stings a bit because we’re used to things having been so easy and they probably won’t be like that again for a long time, if ever. 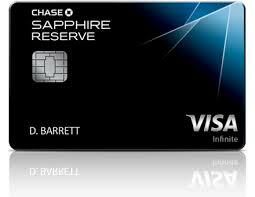 Worst case scenario: I never obtain the Chase Sapphire Reserve, I’m never approved for another credit card bonus again, every point I have gets clawed back, I travel less frequently, and I have more time to spend with my family and/or find a new hobby into which to channel obsessive-compulsive tendencies. I think I can live with that. Over my dead body! I will fight and there will BE blood! Watched K1 and C1 events at the Olympics; excited to get into whitewater kayaking soon. Need to move to a more mountainous region first. …and you sir hold the current lead in my list of best blog posts of the year. Amen. Best post ever. A travel blogger that quotes Seneca–you win the blue ribbon! Actually the demise of MS has liberated me from the treadmill of trying to cycle ever increasing amount of money through the system. And everything is more of a challenge. Ok you’ve put a bigger bolt on the bank door. Well, I’ll just have to go get a bigger set of bolt cutters. Either way, he earned points with both of us. Two writes in one stone. Antifragile is definitely the most stoic of his books, and probably the best. It’s quite good, though I recommend “Fooled by Randomness” to those who’ve never read him before. I think the books flow into each other. Fooled by Randomness – Things are more random than you think. Black Swan – The unpredictable events have the biggest impact on the world. Antifragile – Betting on randomness. But I think his writing gets better with time. Although I find the Black Swan to be the easiest to read / understand… because it has a very singular thesis. If you can’t tell, I’m a super fanboy. Also, Im grateful I know the term for the “hedonic treadmill”. Although it kind of goes against the stoic idea that having less means having less loss… thus less makes you happier. Or my favorite book on happiness is Art Of Happiness by the Dalai Lama. But I had heard studies about people wishing they made 10% more money. Everyone wishes they had 10% more, even when they get 10% more. The banks entice the general public, not just the ‘upper middle class’. Everyone applies, from all walks of life. They’re not giving money away but can be thought to be facilitating a kind of transfer from weaker hands to stronger. They make plenty of money off of one segment of the population in the form of interest and fees, whereas for us ‘hobbyists’ in your chart above (I fit right in though I skew both the age and income toward the right a little), the flow is in the other direction, hence the transfer. In truth, however, it’s tempting to credit one and debit the other — all very neat — but the banks have much more complicated balance sheets. Nice article. Happily, I don’t meet the average either, falling well to the left of median income and to the right of median age. Doesn’t take a lot of income to play this game, if you can play it smart. Pretty amazing what the banks will give on a lower 5 digit income. Helps to have some float, though, for sure, if you want to play it harder. Also, there could be an interesting discussion around why so many people in this hobby are wealthy? It’s not rocket science. Intelligent people recognize opportunities. Or maybe it’s just that “stated household income” belongs on the same list as “the check’s in the mail”? Empire, not republic. More Caligula and less Seneca. LOL. That was the first thing I thought of when I saw the “stated income” data on reddit. hard worker, detail oriented, organized, opportunistic (seeking deals), accomplished (can succeed in whatever), otherwise busy (capacity to get more done in less time)), gets things done efficiently, frugal and probably intelligent. These traits serve one well in business & life, and certainly carry over to the miles/points game. I skew pretty far to the right of the average – especially age. My kids fall into the average demographic. I love the challenge and complexity of the hobby. Since I’ve been at it for about 18 years, I’ve seen a lot of changes. That’s what keeps it interesting. I can play intensely if I want to at any given time, or lay low and let the points and miles grow from strategic everyday spending. Whatever the incentive – points and miles, cash, or the toasters/S&H Green Stamps of my youth, it seems foolish to leave money on the table if banks and merchants are giving it away. I expect to make some return on every dollar I spend because I can. Travel rewards, that result in flying in the front of the plane and staying in 5-star hotels all over the world, are a whole lot more fun than getting a new blender after pasting thousands of Green Stamps into books, which was the incentive program of 97-yr-old mother’s day.